How do I drill holes in order to fasten the clips when mounting the Click Rail to the ceiling? You can mark out the holes by using the Click&Connect feature as a template. The clips are designed such that the screws can be inserted diagonally up to a 10° angle, after which the rail can be mounted to the ceiling. 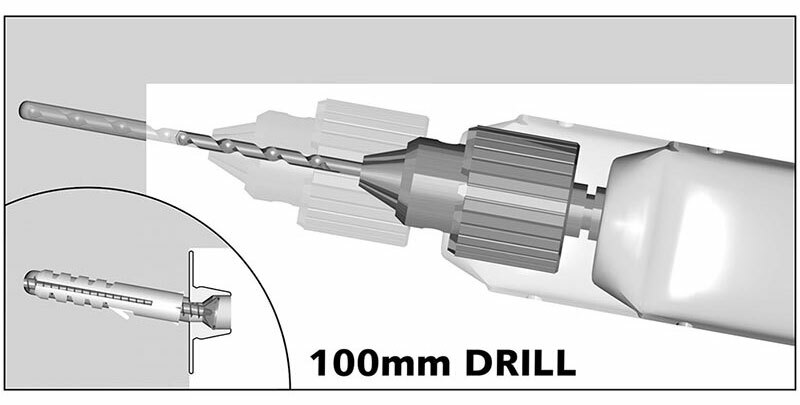 If this angle is too small or if you would like to drill at a straighter angle, we recommend that you use a longer drill or a special drill with a compact head. How do I prevent frames from tilting forward? Frames suspended from a cord are always tilted slightly forward. You may have seen this in museums, where it is done deliberately in order to prevent glare. How far the frame tilts forward and how this can be avoided depends on a number of factors (see the appendix). What type of paint should I use to overpaint my rail? Mosaic Gallery profiles are lacquered using a polyester-based powder coating which is generally easy to overpaint. The primer version can be overpainted using commonly available lacquers (latex-based, acrylic-based or alkyd-based). If you intend to overpaint the profiles, you must first prepare the surface. It is sufficient to remove any excess grease (preferably using surgical spirit) and slightly polishing it with fine sandpaper. Can I reduce the length of the rail? The aluminium profiles can be easily customized by trimming them with a metal saw to reduce their length. It is recommended that you use a miter box to make a straight, rectangular cut. Can I dismount my picture hanging system and reinstall it in another location? The rail is affixed quite firmly to the clips because it must be fastened safely and securely. The system is essentially designed to be mounted once. If you disassemble all the parts, it is important that you carefully examine each component and replace any damaged parts. After you disassemble the system, you must always replace the clips and plugs with new ones. The best way to remove the rail from the clips is by loosening the rail from the clip at the bottom (directly on the clip) using a flat screwdriver. You must start on one of the sides and then work from there to the left or right. In order to prevent wall damage (or at least keep it to a minimum), we recommend that you place a steel or aluminium sheet beneath the screwdriver. Depending on the type of wall, you can then prevent the plug from being pulled out of the wall. Is the Combi Rail Pro Light system dimmable? A dimming feature is really only required when you are lighting a larger space such as a room – it generally does not play a role in spot lighting. When it comes to spot lighting, it is more common to choose a lamp with the desired level of intensity. While it is possible to dim LED lights, this requires that you use the correct combination of components, and it also depends on the length of the rail. Philips has stated that its 7W and 8W lamps are dimmable, but this is not the case with the 3.4W lamp. Since Philips regularly changes the specifications for dimming MasterLED lights, we recommend that you check the Philips Lighting website for further information: www.philips.com/masterledlamps. It is easier to dim the lights if you use halogen bulbs, but you should bear in mind that these bulbs consume five times as much energy as LED bulbs, while the average service life of a halogen bulb is also 20 times shorter than that of an LED bulb. To summarize: while the Combi Rail Pro Light is dimmable, we recommend that you choose not to dim spot lights but rather choose bulbs with the appropriate level of intensity. We recommend that you use LED bulbs as this is less expensive because they consume less electricity and have a much longer average service life. In our experience, the MasterLED 7W meets the requirements of most applications. I have noticed that the perlon cord turns upward. How can I straighten it? You may find that the perlon cord curls up after the perlon has been rolled up for an extended period of time. The weight of the frame is usually enough to straighten the wire again. If this does not achieve the desired effect, you may want to try hanging a weight on the wire over an extended period of time. You can accelerate this process by first soaking the wires in warm (not boiling or hot) water for several hours. We recommend that you drive the screws into the rail beforehand. The best way to insert the screws into the holes is by twisting them one-quarter turn until they are tightly secured inside the rail. Since the aluminium is fairly pliable, you can use the screw thread to make a slight incision. You can then easily feed the rail into the ceiling in one easy step.